1s grand cru classe plants belongs to chateau Latour from the Bordeaux area to five. Through 75 per cent Cabernet Sauvignon is Chateau Latour a Pauillac par excellence. He is described by the connoisseur of wine and wine enthusiasts as firm, great, tannin strong and very ageing capable. Even within weaker years the chateau Latour produces good, balanced and artful red wines mostly. For wine connoisseurs has to be recommended therefore to form chateau Latour of the eye always at the search of a certain vintage wine as a birthday present. 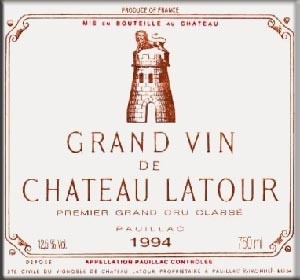 Furthermore Latour is regarded as the most even red wine under the grand Cru Classe producers. The estate of chateau Latour lies in the near of expanse of water of the Gironde. It was already Thomas Jefferson who honoured chateau Latour as one of the best Bordeaux wines in the 18th century. Also the second wine, les Forts de Latour, is a showpiece of his class and much does not take second place to the first wine. Just within outstanding years one should make way for Latour for chateau on the Forts de Latour – he costs only a fraction of the cru classe wine and the pleasure is phenomenal. A wonderful price pleasure- relationship. The estate on chateau Latour became built in the early 14th century in which the property was in the English possession to beginning. Chateau Latour got his name of the fortess tower ‘’ La tour Below Expectations Saint Maubert’’ well, this should serve the good Latour as a defence place in the ‘’Hundred Years Wars’’. Unfortunately, this tower does not exist in today’s time any more, the owner, however, built the chateau Latour in 1620 a similar, just as beautiful tower with names ‘’ La tour de Saint Lambert’’. The copy of this tower is regarded the chateau as trademark since this, and find him on every label from every vintage of the chateau Latour wines. The era on the property should set for her high - attidude flight only much later, though. In 1716 Alexandre de Segur acquired the chateau Latour, two years later his son Nicolas Alexandre de Segur followed him. 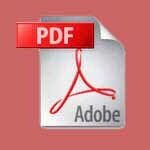 He followed his predecessor in the expansion measure by Nicolas Alexandre acquiring chateau Mouton and chateau Calon. By these canvassing the quality climbed considerably chateau Latour and the star of the tanning strong Pauillac wine seemed to have risen. One built today’s castle as native country place and sign of the owners then in 1860. The top property reached the hands of the family Segur after some property changes to the British companies of Harvey of Bristol as well as to the group of Pearson in 1963. Had aimed at these the supremacy from chateau Lafite in the region to attack, and reducing the renunciation of a right to Lafite Rothschild and the reputation of chateau increasing Latour by improving quality and investments in the cellar and vineyard. An another changing at the apex of chateau Latour was in 1989, as Latour was bought for 180mill. Euro from Allied Lyons. Only short time later in 1993 the businessman and his sign multi- millionaire Francois Pinault acquired the chateau Latour and it therefore brought into a French possession again. Nowadays chateau Latour has developed a strategy quite of its own in marketing and sale as well as distrubition of his wines. So there is rumour that almost 40 per cent of the produced bottles of the century vintage 2005 are still stored on the property in an inventory of their own. It must therefore be assumed that about 120,000 bottles of the premier cru classe wine in the cellars on the chateau Latour slumbers. The owner hereby participates in the great style after subscription of the new wine, wines in the increases in value of the first years. However one can permit Latour the strategy on chateau only by sufficient capital resources within earlier years this was practically unthinkable. All chateau’s were glad about, to have sold the total portfolio completely to be able to produce wine again and have anybody carry out the necessary investments for the next year. By the booming market in Asia, however many wine – growing estate like chateau Lafite Rothschild, chateau Mouton Rothschild, chateau skin Brion and chateau Margaux would like to mention only some, to participate in the climax of return of the wines and maximize the profit. 1934, born ones should not have any problem in finding a good drop her year of birth. 1934 very good wines were produced across Europe. Bordeaux is regarded as the best vintage of the thirties in 1934. There is still much to discover there and the Wineterminator still likes to grasp it at well – preserved 34s, too. (well up: wineterminator.com Dr. Becker). Another long life should have Latour. 1995 from perfect 1 tel. (bn) with a typical mint nose, still clear Tanninen and firm acid, in the same year on Willi – Krählings taste of Latour, a intensive mint nose like a perfect Mouton 45 should to have, fully develops, in last time in the year 2000 a young bottle, mint, Eucalyptus, brittly opens only hesitantly – wonderful depository, need in good bottles of another 1 to 2 decades. (well up: wineterminator.com Dr. Becker). A Latour Magnum had 1996 a firm colour, tobacco nose, was very young, strongly, good still future, 92/100. Last 2006 again one classic Latour with still damned young colour and the typical, easily bitter walnut aromatic, 94/100. A wine with a still good future. (well up: wineterminator.com Dr. Becker). Latour seemed slim on a test in the 59s comparison in 1993, unripe, very firm acid, not let much out of his potential- 94/100. 1995 on Willi Krählings taste of Latour from the Magnum the strength and the splendor -100/100. Completely good in the same year, still simple way from a Marie- Jeanne and – the supergau – from a faulty imperial. After this still repeatedly from bottles of different quality. Thick colour, decadent sweet, energy, light mint, last 1999 on a Best Bottle this unbelievable was 59 Latour like me, him know and love – 100/100. In summer 2005 then still one perfect 1 tel. on 100/100 standard. I kept him poured blindly for considerably younger and imagined me at 82 Leoville read cases in Sylt four weeks later. So have young also in the colour so thick if solid Tannine if a compact fruit. A wine made for the eternity which absolutely decants in bottles stored perfectly like this a couple of hours before put aside one more couple of years better, however, heard- 97/100. Last 2007 on chateau Latour into two variants. Magnificent the ex- chateau bottle. Super colour without every age, multilayered dream nose, very much close on the palate, so young, so powerful, unbelievably complex, Latour in perfection, a wine monument made for the eternity- 99/100. The bottles from a cold Loire cellar worked amazingly a little more ripely sweet ones with an optional feature portion, but also herbages, floral flavours – 98/100 (well up: wineterminator.com Dr. Becker). Latour belongs of the very big wines of the last century. But there is unfortunately different size also. The better one – the predominant part of the bottles – were filled in May, the worse in October. And we had of all things the latter on Willi Kählings of great Latour test from the Magnum in 1995. Harm, the wine worked a little one – dimensionally in comparsing with 59, 62 and 64 and did not do justice to his reputation – 93/100. Of course it still comes to that with such wines that the reading of euphoric rehearsing notes expectations which no wine can fulfi is waking. 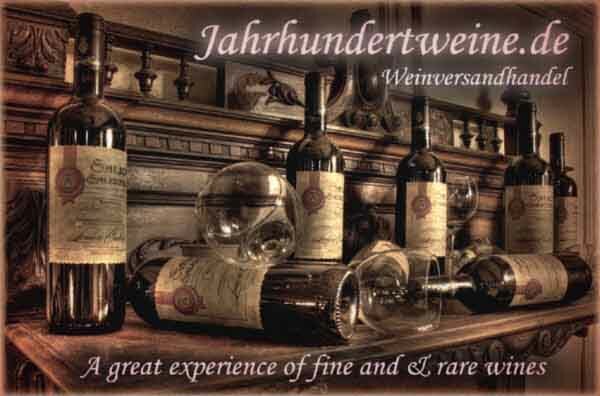 My second bottle in summer 1995 with Jörg Müller was already a completely different caliber with boisterous strength and still much to young. However, I sought the famous 100 points in vain in the glass – 97/100. The third bottle, 1997 in a 61s test was from lousy cellar and had a bad filling level. Splashy colour, nose and palate perfect, mature Cabernet but also a little herbal, one tastes the bad level there, is no more than 96/100, massive Tannine but the fruit in this form away. (well up: wineterminator.com Dr. Becker). Latour, is this a century wine now or not? My first bottles in the second half of 90’s showed strength and potential without end, were, however, quite inapproachable. Three insanity bottles of 2000, everyone at 100/100. Twice, locked in 2001 on the 90s test and following from an inventory of one’s own very much again. 2002 in a sample of magnificent Bordeaux in perfection, 100/100. He was astonistingly tame in 2003. 2004 in the comparsing fruity, flattering than 82 but with a less printing and energy, in a long term the 82 is the greater wine. 2005 and 2006 more half bottles accessible and locked at the same time, let little out but the solid Tannine are not noticeable considerably either. Last 2007 a fun wine par excellence with luxuriant chocolate nose, spare aromatic into the exotic more outgoingly. But also with strength and structure, also very much Tanninen move, however. Will Latours not be part of the most long – lasting ones 97/100. (well up: wineterminator.com Dr. Becker).